FRED DE SAM LAZARO, guest anchor: President Bush admits he’s not always the most articulate man in Washington. 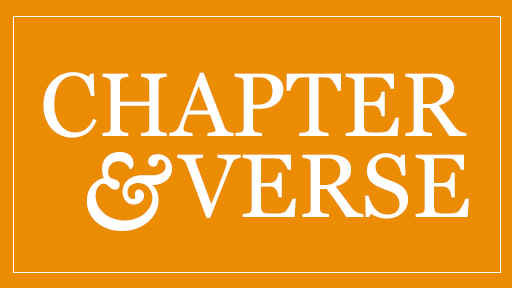 Over the years, he has had a lot of help from a speechwriter named Michael Gerson. 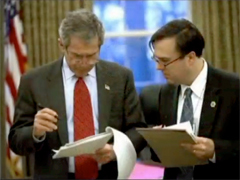 Bush hired Gerson before he announced his candidacy in 1999, and Gerson stayed on with the president until June 2006. He was credited with writing many of the religious phrases that peppered Bush’s speeches. 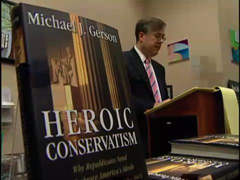 Gerson has written a new book, HEROIC CONSERVATISM, which recalls his time at the White House. He urges conservatives to broaden their political agenda. Gerson spoke with Kim Lawton. MICHAEL GERSON (Author, HEROIC CONSERVATISM, and Senior Fellow, Council on Foreign Relations): That’s a different kind of conservatism, a conservatism of the common good that argues that we need to orient our policies towards people that might not even vote for us — need to make sure that we’re inclusive and hopeful and oriented towards opportunity. LAWTON: Heroic conservatism, Gerson says, is an expansion of compassionate conservative ideals. Mr. GERSON: Since 9/11 I, you know, needed a broader concept to also encompass a commitment to human rights and dignity abroad. I was very involved in the AIDS program in the administration, in Africa, in genocide in Sudan, in malaria programs. Conservatism is not just pro-life, and I am pro-life, but it’s also pro-poor. LAWTON: A lot of faith-based liberals might say, “Well, we’ve been involved with human rights. We’ve been involved with poverty.” What makes this an essentially conservative idea? Mr. GERSON: Well, I want to argue that those things need to be important to conservatives. And I see a shift taking place. It’s a broadening of this religious prospective of conservative Christians, and they’re looking for a new model of social engagement. LAWTON: How much resistance is there within the Republican Party, within — even among the religious right to some of these ideas? Mr. GERSON: Well, I found a lot of resistance. For example, in the faith-based initiative, which some people have dismissed as radical — it’s not at all. Some people thought that they were too liberal because the goal was to help the poor. Some people thought they were too expensive: Why are we spending this money? Some people thought it’s just not our job: We’re Republicans. We’re supposed to just play around with the tax-code. LAWTON: Gerson is an evangelical Christian and believes religious faith is one important foundation of heroic conservatism. He is highly critical of secularists who would try to keep religious influence out of public life. Mr. GERSON: Do you really want to say we’re going to take religion out of politics, okay? It wouldn’t just get rid of Osama Bin Laden and maybe Pat Robertson. It would also get rid of Martin Luther King. LAWTON: Gerson is now a senior fellow at the Council on Foreign Relations. He says America has a moral calling to spread democracy around the world. Mr. GERSON: In the aftermath of 9/11, it’s not just a moral mandate that comes from our history. It’s also a national security priority. LAWTON: During his time at the White House, Gerson helped write some of Bush’s most memorable speeches, speeches that included references to faith, God, good and evil. (to Gerson): How much of those speeches are you, how much are they the president? Mr. GERSON: On the major speeches — a speech to the United Nations, a State of the Union address — the president was involved early and heavily. Then, once he had an imprint on the outline, we’d produce a draft, which would go to the senior staff. There’d be a lot of input from other people. It’s always a cooperative enterprise when we do these things. But the president then would start to mark it up. So by the time he delivered a major speech, one of the large ones, every word was pretty much his. LAWTON: Many of the speeches used allusions to Scripture verses and hymns. Some critics even questioned whether Bush was speaking in code to religious believers. Mr. GERSON: These aren’t code words. They are our culture. You know, millions of people understand them, and just because if some people don’t get them doesn’t mean that there’s some kind of plot. I think that without those things that American rhetoric would be infinitely impoverished. LAWTON: Why do the words matter? President BUSH (during speech at Washington National Cathedral): This world he created is of moral design. Grief and tragedy and hatred are only for a time. Goodness, remembrance, and love have no end. Mr. GERSON: These were fresh wounds in America, and I sat there in that cathedral and realized the words really counted at that point. They don’t always. You know, you do a lot of speeches when you’re at the White House, hundreds of them. But at a few moments the words really matter. 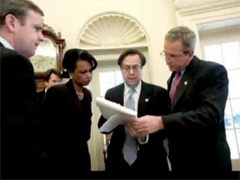 LAWTON: In his new book, Gerson isn’t critical of Bush. He does criticize other administration officials, especially former Secretary of Defense Donald Rumsfeld, for his strategy in the Iraq war. Gerson says his worst time at the White House was watching the lack of progress after Hurricane Katrina. Mr. GERSON: In the aftermath of that disaster, Republicans were focused mainly on the cost of recovery, budget. Democrats were mainly focused on the apportionment of blame. Very few people in our political system took the broader issues of race and poverty seriously. LAWTON: He says his proudest moments were Bush initiatives to help AIDS victims in Africa and to stop the spread of malaria – policies, he says, that have been overshadowed by the situation in Iraq. Mr. GERSON: Government can do good under the right circumstances, with the right theory, with the right approach. I think conservatives need to recognize that. I think there are moral reasons to recognize that. And I also think there are good political reasons, too. LAWTON: Politicians who don’t recognize that, he says, don’t deserve to win.